The Palace of Nations. 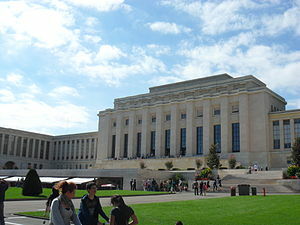 The United Nations Office at Geneva (Switzerland) is the second most important UN centre, after the United Nations Headquarters. While the Secretariat of the United Nations is headquartered in New York City, its many bodies, specialized agencies and related organizations in other parts of the world, particularly in Europe. ^ Le Temps, Friday 3 July 2015. This page was last edited on 5 March 2019, at 16:18 (UTC).